Ask and you shall receive, dear friend. Anyone else have a request? Old Prom pics? Baby pics? Perhaps some from my not-so-cute "pleasantly plump" years? (And no, that doesn't mean the last few years up to now...) Oooh, what about slumber party pics? Pregnant pics? G'head and ask. More than likely I'll post 'em. 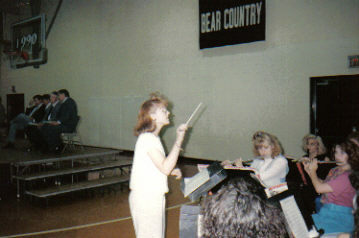 Hillbilly Mom can tell you that if you ask, I'll even post pictures of me as a Band Geek in the throes of directing the band all by myself. OOOHHHHHH! I LOOOOVE IT! Something about that look on your face. And those bangs! You've really outdone yourself, Diva. Thank you OH SO MUCH. I will have to do some diggin', though the best one I had was used last year for Big Blogger's billboard. I dare not resurrect that monstrosity. But it's still out there for any treasure hunters who feel lucky. How abot a shot of you in a green t-shirt, with Chirstmas things in your hair, and an Oh So Pretty look on your face? Oh, sorry, that one has already been done by HillBilly Mom. Judging from the people sitting on the stage behind you I'm guessing this was a graduation performance! Considering the gym didn't have air conditioning, your hair stayed up amazingly in the heat! Happy Belated Mother's Day sweetie! Is that a side ponytail? Or is it just your bangs? Wow..you were good at the band wall. Mine never made it past 11:00. Big bangs or not, I'd a still done ya'! Actually those guys on stage look to be wearing FFA jackets, and if I'm not mistaken, I believe that's me on the end nearest to you. Boy, FFA, that was a big waste of 4 years. What was I thinking? Ahhhh, yes I believe those are upon closer inspection FFA jackets, I stand corrected. You'd think after 4 years of it too I'd be able to recognize one. Hillbilly Mom, but you know that at any time any one of us could resurrect that charming picture for you, right? Right? So post something new for us or we'll get nasty. MUAHAHAHAH! Rebecca, no one does green shirts and Christmas ornaments in the hair quite like Hillbilly Mom. No one. Mrs. Coach, my hair stood up in a tornado back then! I wish I had the money I spent on RAVE and AquaNet back then. I'd be able to tell the friendly folks at Discover to kiss my formerly ginormous bangs! Irish Divinity, I used to have to drive slumped down in my seat because my hair brushed the headliner of my car! Now, that's big hair! M'Kay, RAVE, AquaNet, jet fuel...we didn't care as long as it hardened to a shellac-like finish and was impossible to wash out! Anne, no, I never went as far as a side ponytail. Those were just my incredibly scary bangs. Man, those were the days. Cedric, I think I'm flattered! Cedric (again) and Mrs. Coach, Ahhh...you and Mrs. Coach are both incorrect. It was Graduation 1990. Notice the big "1990" over the basketball goal? And the guy on the end wasn't you, just some guy there to present a scholarship or something.